Back pain can result from a number of causes. Many are muscular or ligament injuries, but there are other specific injuries which can be diagnosed. Sciatica, disc injuries, and poor core strength are some of the most common causes. Most back injuries will settle with appropriate rest and treatment, however, some require further assessment. Minor back injuries are usually recommended to apply protection (back support), rest, ice, and compression. Here we outline when it might be suitable to seek professional advice. Lower back injuries occasionally require medical care, especially if they are severe. Similarly, those that are associated with pain that lasts a long time or experiences ongoing impairment following a sporting injury should always be seen by a doctor or healthcare professional such as a physiotherapist, sports therapist, chiropractor or osteopath. Severe back pain that lasts more than 24 hours. Significant leg pain that came on after experiencing severe back pain. Referred pain into the legs and/or feet following a back injury, especially if the symptoms do not decrease within 24 hours. “Pins and needles” (paresthesia) feeling or “loss if feeling” (anaesthesia) in the legs or feet. There are many different types of therapists who claim a special interest in treating back pain including Chiropractors, Osteopaths, Physiotherapists, Sports Therapists, and Massage Therapists. There are good and not so good in all professions so finding a doctor or physical therapist you trust and get results from is probably more important than any specific type of therapy. Read more on types of therapist. Sciatica is a symptom, not a diagnosis of a particular injury. Sciatica pain usually, but not always starts with acute low back pain which radiates into the buttocks, back of the thigh and legs. Sciatic pain may be sharp or acute and be accompanied by tingling, pins and needles or numbness. It is often triggered by a minor movement, such as bending over to pick something up and often made worse by sitting, coughing or sneezing. A slipped disc (prolapsed disc) is a common cause of sciatic pain, but there are a number of others. Read more on sciatic pain. A herniated disc is sometimes also known as a slipped disc or prolapsed disc. It can occur anywhere in the spine, although is most common in the lower back. Symptoms including back pain, leg pain, neural symptoms as well as bowel and bladder problems. If you think you may have a slipped disc the best course of action is to visit your Doctor. He/she will be able to make an assessment and determine if what treatment or investigations are needed. They may also refer you to the hospital for a scan such as an X-ray, MRI scan or CT scan. In many cases, a slipped disc in the lower back will heal with conservative treatment (without surgery). Initially, this involves rest and the use of anti-inflammatory medications or NSAID’s such as Ibuprofen. Physical therapy with the use of gentle mobilizations and extension exercises may be prescribed. A corticosteroid injection may be given in severe cases, which show no signs of improvement naturally. Traction is often helpful for patients with a disc herniation, although in some cases the initial pain relief was followed by an increase in pain after treatment. Surgery may be required, in cases where the symptoms do not improve or the individual suffers repeated bouts of pain. Read more on slipped disc. The Sacroiliac joint is located at the bottom and just to the side of the back and can become painful and inflamed, causing pain in the lower back which can spread to the buttocks. The pain can be caused by a traumatic impact, poor biomechanics, inflammatory disease or from hormonal changes, such as pregnancy. Symptoms of Sacroiliac Joint Pain consist of pain at the bottom of the spine which is located usually on one side, either to the left or right of the spine, although sometimes is described as a band of pain across the lower back. The pain can range from an ache to a sharp pain which restricts movement. Sacroiliac joint pain may radiate out into your buttocks and low back, and will often radiate to the front into the groin and occasionally testicles. Treatment involves rest and ice or cold therapy to reduce pain and inflammation. A professional therapist may mobilize the joint and surrounding tissues and advise on rehabilitation exercises. Read more on sacroiliac joint pain. Paravertebral trigger points are tight localized knots or lumps in the muscles either side of the spine which cause back pain. Trigger points can be active or latent. Muscular trigger point symptoms include back pain with over tight muscles in the back. An active trigger point will cause pain even at rest and may cause a twitching in the muscle. The trigger point will be painful if pressed and may cause referred pain (e.g. pressing in at one point causes pain somewhere else). Latent trigger point symptoms include tenderness at a specific point, but the pain is not referred to other areas when the trigger point is pressed and trigger point does not stimulate a twitching in the muscle. Treatment options for Paravertebral trigger points include cold therapy, stretching, and deep tissue sports massage techniques which are an excellent way of treating muscular trigger points. Symptoms of a weak back include pain, tiredness, and stiffness in the lower back, which gets worse during the day, especially if you are standing for a long period of time as well as pain in the lower back after lifting. A weak back can give pain in the lumbar (lower) region of the back. It is caused by the muscles in the back and abdomen not being strong enough to do their job of supporting the spine properly. Poor posture is also a contributory factor putting more strain on back muscles than is necessary. Back strengthening exercises, core strengthening, pilates, and improving posture are all options for improving back strength. 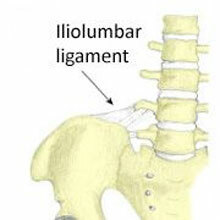 An Iliolumbar ligament sprain is an injury to the Iliolumbar ligament between the pelvis and the 5th lumbar vertebrae. This ligament may be injured after a sudden movement or repeated bending and lifting. Iliolumbar ligament sprain symptoms include pain in the lower back right at the bottom and just to one side of the spine. The patient will experience pain when bending forwards or sideways with a reduced range of movement. There is likely to be muscle spasm on the injured side with tenderness when pressing on over the ligament. Treatment of iliolumbar ligament sprain includes Cold therapy to reduce pain and swelling if present. When pain allows, deep tissue sports massage techniques to mobilize the soft tissues in the area particularly the buttock and hip muscles. Stretching techniques for the muscles of the hip and buttocks. If this fails, a corticosteroid/anesthetic mix injection may be useful. Spinal stenosis is a condition seen more in older athletes where the spinal canal narrows causing pressure on the nerves with resulting pain and numbness. Spinal canal stenosis symptoms include low back pain which can radiate into the buttocks and the back of the leg. Symptoms are often worse when walking or standing and can be reduced by sitting or lying in the fetal position. In server cases, bowel and bladder problems may be present. The patient is likely to complain of weakness and tiredness in the legs. An X-ray can confirm the diagnosis. The lumbar spinal canal is the space in the spine through which nerves pass into the legs. Over time this space can narrow due to bone and tissue thickening (stenosis). Wear and tear on the bones and joints of the spine can cause narrowing of the spinal canal. Arthritis Trauma, such as a fall or accident. If symptoms are mild then an exercise programme may be the best course of treatment initially. Core strengthening exercises to improve back muscle strength and posture. Drugs may be prescribed to reduce pain and swelling in the spine. In severe cases, surgery may be indicated. A lumbosacral sprain is a ligament injury in the lumbar or sacral areas (lower back). A sprain usually occurs after a forceful or rapid movement which overstretches and maybe tears a ligament. Symptoms of a Lumbosacral sprain may be similar to many low back injuries with pain in the lower back which is often located to one side of the spine. There will be a pain when bending and twisting, muscle spasm and stiffness in the back. The area may be tender to touch over the area of injury and there may be some swelling. Lumbosacral sprains are ligament injuries caused by overstretching a ligament and possibly tearing it. This usually occurs due to a sudden forceful or rapid movement, especially twisting or side bending. There are a number of ligaments which could be damaged in the lower back area. The 5 lumbar vertebrae are held together by ligaments at the front and back, as well as in between the transverse processes. These are most likely to be injured. The sacroiliac joints are also held together by ligaments, although as there is very little movement available at these ligaments, the risk of injury is low. The final ligament which may be injured is the Iliolumbar ligament. This passes from the top of the pelvis bone to the transverse processes of the 5th lumbar vertebrae. Treatment of lumbosacral sprain includes rest from activities which aggravate the injury. Apply ice or cold therapy to ease pain and inflammation. A Doctor may recommend anti-inflammatory medications. After the initial acute period, sports massage may help to relax muscle spasms. Once pain-free to do so, gentle stretching exercises will help regain full movement. If symptoms persist, seek medical attention. Also, seek medical attention if there are any neural symptoms such as tingling or numbness. Sports massage may be used to help ease muscle tension. Scoliosis – this is an S shape deformity in the spine. Hyperlordosis – is an exaggerated lumbar curve in the spine. A transverse process is a bony protrusion from the back of a vertebrae bone in the spine. There is one on each side of every vertebra in the cervical, thoracic and lumbar spine. Symptoms include sudden pain in the back at the time of injury. There will be a decreased range of motion of the affected area of the spine and pain when trying to bend or twist the affected area. In particular, there may be tenderness and swelling around the site of the fracture. A transverse process fracture is quite a rare injury. It usually results from a sudden extreme twisting or side bending movement. Occasionally it may be due to a direct impact to the process itself, although they are pretty well covered by muscle, so this is not common. Avulsion fractures of the transverse process may also occur in the lumbar spine. The Psoas muscle attaches to the transverse processes and a strong contraction of this muscle may cause one or more fractures. Because of the location of the fracture, it is unlikely to cause any instability of the spine or any damage to the spinal cord. If injury to the vertebrae is suspected always seek medical attention as soon as possible. An X-ray will be taken to confirm the diagnosis and the extent of the injury. The presence of associated injuries should also be investigated due to the level of force required to fracture a transverse process. CT or MRI scans may also be performed. Providing there is no associated injury and the transverse process is not displaced, then the majority of fractures are treated conservatively, without surgery. A brace may be used to ensure the spine is kept still and straight to allow healing of the bone. A gradual introduction of spinal movement can be used once the bone has healed and the patient is pain-free. A compression fracture of the spine is a break in one of the vertebrae bones due to a compression force. These occur most frequently in the lower back due to the additional weight of the vertebrae above. Spinal compression fracture symptoms include pain at the site of the fracture which may radiate into the hips, buttocks or thighs. Neural symptoms such as numbness, tingling and weakness may be present along with bladder or bowel symptoms depending on how the fracture is pressing onto the spinal cord. Compression fractures, as the name suggests, occur due to a compression force on the spine. This may happen during a traumatic injury, such as a fall from a height, landing on the feet or buttocks. More frequently, vertebral compression fractures in older people with osteoporosis or other pre-existing spinal conditions where the bone is weak. There may not be one particular incident that causes it and pain may develop gradually. 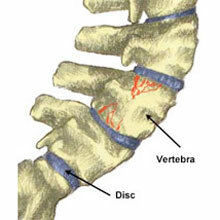 Due to the weakening of the bone, the vertebra is squashed under the weight of those above it. As the bone thins it can’t carry as much load and so fractures occur more easily. In patients with multiple compression fractures, they may start to develop a bent over appearance. This is because the vertebrae carry their weight through the bodies at the front and so become compressed at the front and remain the same at the back. Imagine a wedge shape! Nerve involvement is common in both degenerative and traumatic compression fractures due to the close proximity of the spinal cord and nerve roots. If you have back pain after a fall, seek medical attention. After an examination, a Doctor may request an X-ray or a CT scan to confirm the diagnosis. Traumatic compression fractures usually require surgery to pin the vertebrae back together and avoid slippage or spinal cord injury. Rest from aggravating activities. Relieve the pain symptoms as best you can. A doctor may prescribe pain killing medication. A back support may help take some of the load off the vertebra. Try to treat the osteoporosis with weight-bearing exercise and increasing calcium intake. If the vertebra collapses, there is a possibility that surgery may be necessary. A procedure called vertebroplasty may be performed. This involves injecting a cement-like material into the vertebra to stabilize the fracture and restore the height of the bone. Spondylosis is a term used to describe bony overgrowths of the vertebrae which form the spinal column. It has previously been known as spinal osteoarthritis although this is not technically accurate. Spondylolysis is a stress fracture of a part of the spine called the pars interarticularis. It is an overuse injury and is more common in young athletes involved in sports requiring lots of bending backwards and rotation of the spine.